And now to another of Donald Trump's cabinet picks who might have a tough time managing his new agency staff. 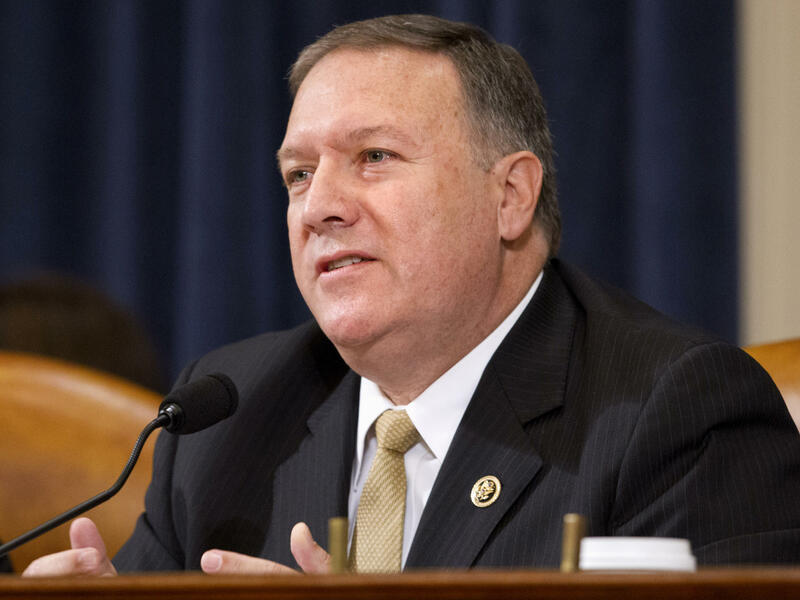 His name is Mike Pompeo, and the president-elect has tapped him to lead the CIA. He's a Republican congressman from Kansas. And if he's confirmed, he'll find himself trying to bridge a trust gap between the CIA and a president who has openly attacked the country's largest intelligence agency, even before coming into office. NPR's Mary Louise Kelly reports. MARY LOUISE KELLY, BYLINE: Mike Pompeo is no stranger to Russian intrigue. After graduating first in his class from West Point, back in 1986, he headed to Europe where, according to his official bio, he served as a cavalry officer, patrolling the Iron Curtain before the fall of the Berlin Wall. Since his election to Congress six years ago, Pompeo has carved a reputation for taking hard-line positions. Here he is on C-SPAN back in February, talking about the former NSA contractor, Edward Snowden. MIKE POMPEO: He should be brought back from Russia and given due process. And I think the proper outcome would be that he would be given a death sentence. KELLY: Then there's Iran and the nuclear deal. The current CIA director, John Brennan, recently told the BBC that tearing up that deal would be, quote, "the height of folly." JOHN BRENNAN: I think it would be disastrous. It really would. For one administration to tear up an agreement that a previous administration made would be almost unprecedented. KELLY: Cut to Mike Pompeo. The day before his CIA nomination was publicly announced, he tweeted, I look forward to rolling back this disastrous deal. Then there's Benghazi. POMPEO: Ambassador Stevens did not have your personal email address. We have established that. HILLARY CLINTON: Yes, that's right. KELLY: That's Pompeo, a Harvard-trained lawyer, grilling Hillary Clinton during hearings investigating the 2012 attack on the U.S. diplomatic mission in Libya. POMPEO: Did he have your fax number? POMPEO: Did he have your home address? KELLY: After that congressional investigation found no evidence of wrongdoing by Clinton, Pompeo and one other Republican wrote their own 48-page addendum to the official report, alleging a cover-up and harshly criticizing Clinton. So here's the question. How might Pompeo handle the leap from the partisan knife fights of Capitol Hill to the challenge of running an agency that is supposed to operate above the political fray? Jane Harman spent 18 years in Congress. She was the top Democrat on the House Intelligence Committee. Harman says Pompeo will have to change roles. JANE HARMAN: He's been in the politician role. Now he's going to be in the speak-truth-to-power role. And he should be asked about his views in confirmation hearings. I'm sure he will be, you know, among other things. The head of the CIA has to go dark. KELLY: Meaning has to stay out of the headlines, which is definitely not where the CIA currently finds itself. Three Senate committees now say they will investigate Russian cyber hacks and why the CIA has concluded the motive for them was to elect Pompeo's soon-to-be boss. JOHN MCLAUGHLIN: This is not a good situation for a CIA director to inherit. On the other hand, welcome to the CIA director's world. KELLY: That's John McLaughlin, who knows that world firsthand having served as acting director of the agency. MCLAUGHLIN: CIA director is almost always dealing with some kind of controversy. This one's bigger than the average one. And it comes on top of all of the other things he's going to have to do. KELLY: Such as unraveling the war in Syria, says McLaughlin, or destroying ISIS. MCLAUGHLIN: Anyone moving from Capitol Hill to CIA is crossing a sort of Rubicon because the mission of the agency is to look at events in the world dispassionately, I would say even clinically, and then to step back and let the policymakers decide what they wish to do with that. KELLY: There are hints that Pompeo may already be beginning that transition, taking steps towards going dark in preparation for his confirmation hearing. He has laid low since being nominated, not a single interview. This past weekend, as the controversy over the CIA and Russia erupted into a full-blown political and media frenzy, Pompeo was tweeting about a Santa's village. He's still a Kansas congressman, remember. And the actress Kirstie Alley has built a snowy tableau in the front yard of her Wichita house. Looks great, @kirstiealley, wrote Pompeo. He hasn't tweeted since. Mary Louise Kelly, NPR News, Washington. Transcript provided by NPR, Copyright NPR.